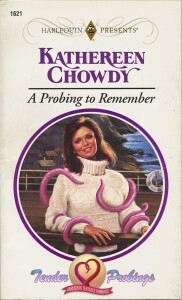 A Probing to Remember by Kathereen Chowdy – This Photoshop sight gag Tumblr occasionally riffs on old Presents covers. This one was amazingly apropos. In Search of Lesbian SFR: The Good, The Bad, and the Ugly – Author Cathy Pegau guest posts at the science fiction romance blog The Galaxy Express about how hard it is to find lesbian or f/f SFR at online retailers. (Spoiler alert: it’s wicked hard.) She lists some suggested reads at the end. Does B&N not realize lesbians are typically female? That lesbian romances usually involve at least two women? My Parents Chose My Husband – An Indian-American woman relates the story of her arranged marriage. Alex and I have been married for 17 years, and our relationship is stable. But the life we live together is still difficult for me to reconcile. For one thing, the words “arranged marriage” conjure up images that have nothing to do with me. Child brides and dowry burnings on the one hand, or henna and Bollywood on the other. I grew up in the United States, a product of New England suburbia, evangelical Christianity, Wellesley College, Pride and Prejudice and When Harry Met Sally. I was the bicultural kid who wore salwar kameezes during the day, read Sweet Valley High at night, and swooned over “happily ever after” stories. But I always knew my marriage would be arranged. Call for Submissions: TFW Forum on Disabilities, Ableism, and Disability Studies – The Feminist Wire is soliciting papers for an upcoming forum on disability. We thus conceived of this forum as a space for wrestling with the issues raised by academia’s rediscovery of disability and its (mis)appropriation for various intellectual projects. We ask: Why disability, and why now? What are the stakes, and for whom, in melding disability with various studies of “the other”? Is there something about disability that should make it “exempt” from use as a metaphor? And what of the established field of disability studies? How do new explorations of disability expand upon or constrain the praxis-centered disability studies project? How might the project of critical disability studies learn from disability activism and justice work?